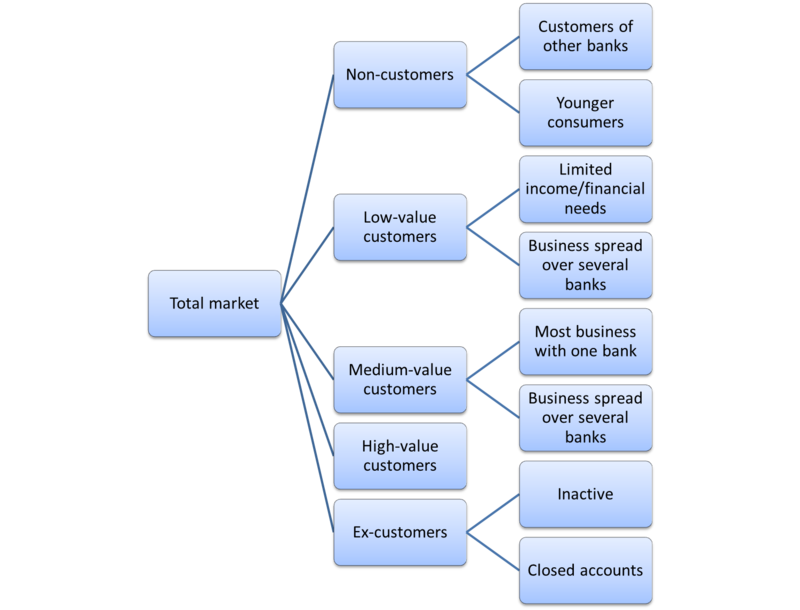 Probably the easiest approach to segmenting a market for a bank is to look at customer value segments and the progression through the customer relationship life-cycle. 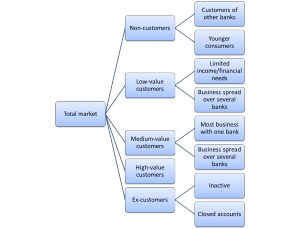 In terms of the customer relationship life-cycle, the bank will look to attract first-time customers (which are typically low in value to the bank in their early stages) and then, primarily through a series of direct marketing activities, the bank attempts to up-sell these consumers and gain greater share-of-wallet to make it more profitable. Non-customers are those consumers that have never dealt with that particular bank before. They will primarily consist of consumers who are customers of competitive banks, as well as younger consumers that are yet to form the first banking relationship. Non-customers are frequently the target of banks primarily interested in expanding the size of the customer base with the intention of growing their value over time. Non-customers who have relationships with competitive banks will be interested in special offers and deals, provided they are either shopping around for a major purchase (such as a new mortgage) or are currently dissatisfied with their existing bank/s. Non-customers who are young consumers are sometimes targeted by banks by school savings programs, in an attempt to win their long-term loyalty. There are two groups of low value customers. The first group is those consumers who have limited income and/or limited need for financial products. It is likely that this type of consumers will only ever contribute a low level of profitability to the bank. Therefore, it is uncommon that this long-term low value market segment is an important target market for any bank. The second group of low value customers is those who diversify the financial products across different financial institutions. For example, an investor may choose to have their $100,000 in savings deposited across four banks. This group of customers, while generally providing a very low profit contribution for an individual bank, they do provide some potential to be migrated into a medium-value customer if the bank can win greater share-of-wallet. The challenge is to convince these risk adverse customers to be willing to place most or all of their financial business with one bank. Medium-value customers also fall into two groups. The first are those customers who have the majority of their business with the financial institution and, therefore, have limited potential to become a high-value customer. The second group of medium-value customers consists of people who have significant financial business with other banks, possibly because of special offers or the preference to diversify their accounts. High-value customers have larger deposits and loans with the bank and form the basis of the financial institutions ongoing profitability. While they may be more costly to retain – in terms of additional customer service and special deals – their overall profit contribution is highly attractive to most banks. This market segment consists of consumers that have either become inactive and have stopped using the bank or may no longer deal with the bank at all. While theoretically representing a potential opportunity, this is a hard market segment to re-engage with. This is because these consumers had trialed the bank but now choose to place all of their business with other financial institutions. Occasionally this is due to a change in personal circumstances, the generally it can be associated with changing needs or some level of dissatisfaction with the bank. This style of market segmentation, which is a usage-based segmentation (under the broad category of behavioral segmentation), is less effective for creating a profile and an understanding of each market segment – but it is highly effective for helping determine appropriate marketing strategies for each target market. For example, high-value customers typically require relationship marketing tactics, medium-value customers can be pursued with special offers and direct marketing programs, while low value customers essentially need to be targeted through general advertising, corporate communications, branch merchandising, and low cost Internet promotions. While this is a significant simplification of the customer relationship management tactics required for each segment, it does highlight that the market segmentation process is sometimes used to guide marketing programs, rather than to profile the segment itself.